Swinging by the restaurant to see the set-up and dress code. Having a look around at a busy time so you can see the clientele. Researching the menu so you’ll have some idea of what to order. Looking up terms on the menu that you may not understand. Familiarising yourself with the language of the menu so you aren’t freaked out when you realise that it’s in French or Japanese. 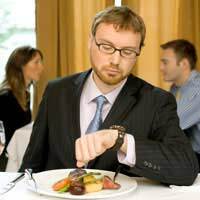 Succeeding at lunch and dinner interviews depends upon succeeding at answering the interview questions and succeeding at socialising during the meal. The former is all down to you, but the latter can be assured with just a few easy rules. Wait until everyone is seated to put your napkin in your lap. Use your utensils from the outside in and remember that your bread plate is always to the left. Keep your elbows off the table and your mouth closed if you are chewing. Eat from every dish that is brought to you, even if broccoli soup isn’t your favourite. Order a mid-priced meal that is easy to cut and won’t be messy. Avoid alcohol or partaking in just one glass to be social. Say thank you to every server, every time they appear. Lay your utensils on your plate and your napkin on the table next to your plate when you are finished. When your lunch or dinner interview is coming to a close, remember that there are still ways to make an impression even after the last crumbs of dessert have been taken away. Allow your host to pay the bill, and thank them graciously before leaving the table. Thank your host again when you are leaving the restaurant, combining this with a firm handshake. Lunch and dinner interviews bring even more potential for embarrassment and disaster than an office interview. They also bring the chance to socialise with prospective employers, enjoy a good meal and show off your social side. If you’re being taken out for a lunch or dinner interview, remind yourself that you’re closing in on the position already. Enjoy!